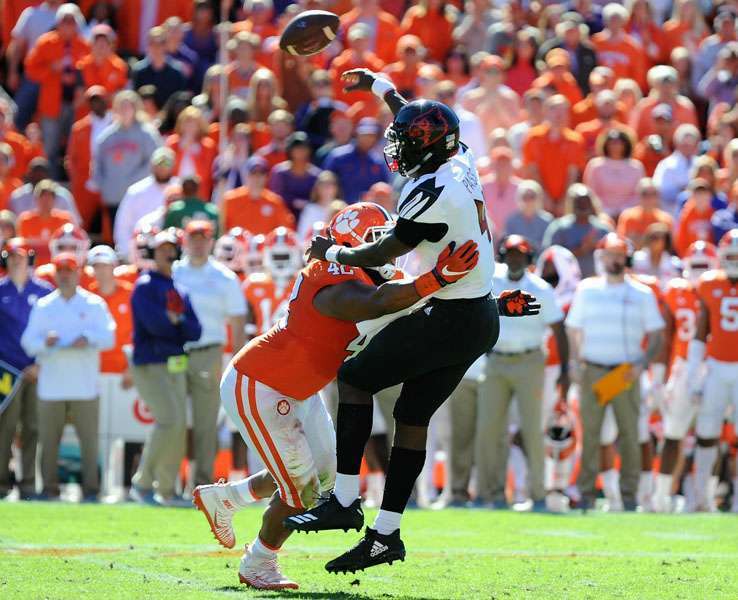 Clemson, SC – Clemson defeated Louisville 77-16, and the score made the game seem closer than it really was. Ten different players scored touchdowns – including Will Swinney. Clemson ran 57 plays and scored 77 points, Louisville ran 70 plays and scored 16 points. This is the type of game that changes programs and that coaches don’t survive. Every sign leading up to kickoff pointed to a Clemson blow out – but Coach Swinney described the players’ preparation mindset akin to preparing for the Super Bowl. Two years ago, this matchup on the same field was like the Super Bowl. the two best quarterbacks in the nation faced off against each other in a Game Day thriller that captivated the nation. This year, things were night and day. Clemson’s backup quarterback was the leading passer – Chase Brice completed six of his seven passes for 110 yards and three scores. 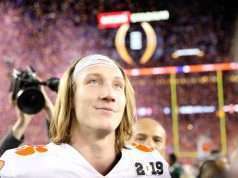 Star freshman Trevor Lawrence completed eight of his twelve passes for 59 yards, two scores, and a pick. The feeling of a lopsided matchup became tangible from kickoff. Clemson drove 75 yards in 75 seconds to score the opening points in what would be Clemson’s largest victory in conference play in school history. Continuing their historic run, the defense forced Louisville to punt after a three-and-out. Tavien Feaster was the running back on the second series, and Louisville was just as helpless against him. He broke a 70 yard run for a score to put Clemson up 14-0 less than three minutes into the game. What followed next was Louisville’s best offensive performance of the day – a sixteen play drive that lasted nearly nine minutes. A frustrated Clemson coaching staff called a time out after Louisville entered the red zone, and the smart maneuver energized the Tigers to hold the Cardinals to a field goal. Another drive led to yet another dismantling of Brian Van Gorder’s historically bad defense. 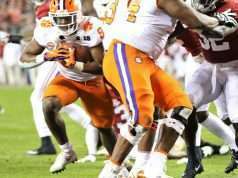 The first play of the second quarter was Clemson’s third scoring play of the day – as Trevor Lawrence threw a beautiful eleven-yard slant pass to Tee Higgins to cap off yet another precise drive. Not content to let the offensive players score all of the points, Isaiah Simmons returned his first career interception for a touchdown to put Clemson up 28-3 with over eleven minutes left in the half. After another forced punt by Clemson’s defense, Louisville’s defense managed to force Clemson’s offense (with Trevor Lawrence in the game) to go three and out. Cornerback AJ Terrell was ejected for a controversial targeting call, weakening Clemson’s depth at its thinnest position as senior Mark Fields was out with a groin injury. Clemson stopped Louisville’s fourth down conversion attempt on the next drive, only for Trevor Lawrence to overthrow a deep pass that landed in the hands of Louisville’s Anthony Johnson. After letting the 28-3 score settle in a little too long for comfort, Clemson’s offense responded with another incredibly efficient drive to finish the first half. All seven plays of the 60-yard drive were for positive yardage – highlighted by Etienne’s 32-yard rush and Lawrence’s three yard scoring pass to Amari Rodgers. Clemson continued to score in the second half, but the touchdowns would come in new and interesting ways. Another Power Ranger scored a touchdown – this time Dexter Lawrence was the fullback in the I-formation who rushed for a two-yard score. It was a fitting tribute to Coach Swinney’s college coach Gene Stallings, whom was in Clemson along with numerous of his former teammates. What’s the difference between Christian and Dexter’s rushing abilities? Coach Swinney described Christian as more agile and Dexter as more brute force. That made no difference to the Louisville defense – whom let ten different players score on them ranging from Dexter Lawrence to Will Swinney and everyone in between. Tanner Muse intercepted another pass from Cardinals quarterback Jawon Pass in a play that Coach Swinney contributed to his improved ability to not aggressively chase down every play. Feaster rushed three times for the nine yards necessary to take the score to 49-3 midway through the third quarter. Adam Choice had a spectacular 30 yard run that Coach Swinney praised as “the heart and soul of Adam Choice today. That drive where he just kept going is the epitome of who that guy is. That play was amazing, and I’m really proud of him.”His run kick started Clemson’s next drive that ended with a pass to Trevion Thompson from Chase Brice. The punt before that drive, Marlon Character was ejected for targeting Amari Rodgers (and celebrated his ejection), and on the punt after that drive Maurice Burkley was flagged for decking Will Swinney on a punt return as catch interference. In one of the most humorous plays of the week, Chase Brice fumbled the ball which a Louisville player fumbled and returned for 30 yards, and then he fumbled it and it was recovered by Cannon Smith. Brice then threw a 15 yard pass and a 59 yard strike to Justyn Ross for a score. Coach Swinney has long praised Sawicki for his kickoff abilities, and Clemson fans got to see him in action after Ross’ touchdown. Has Hall returned the kick for six points, and then Christian Wilkins blocked the Cardinals extra point attempt to make the score 63-9 near the end of the third quarter. Lyn-J Dixon rushed for a 55-yard touchdown, Louisville replaced Jawon Pass with Mal Cunningham whom led a scoring drive, and then Chase Brice led Clemson’s last scoring drive that ended with a touchdown pass to Will Swinney to make the score 77-16. Clemson rushed for 492 yards en route to setting a record for the most points scored in a four game stretch in Clemson history. Clemson has also outscored their last four opponents (all ACC teams) 204-36, demolishing an FSU record from 2000. Lousiville has surrendered 1653 rushing yards in the past four games in one of the worst seasons in program history. Two years ago after Clemson’s narrow win against Louisville, a 77-16 win on the same field would have been unimaginable. College football is an ever changing world where momentum matters – Clemson has not reached their potential yet while Louisville is wondering if they hit rock bottom. In short, this is a program defining game on both sides of the field.